In a true show of collaboration and cross pollination, Groundwork Lawrence and the Mayor of Lawrence’ Health Task Force (MHTF) have produced Healthy on the Block/Bodegas Saludables. This healthy corner store initiative tackles the high levels of obesity and chronic diseases among city residents, assisting corner store owners in Lawrence in offering healthier options, including higher quality fruits and vegetables, at a reasonable price to their customers. The initiative, funded by Lawrence General Hospital, has received positive response locally, and was joined by yet another creative youth development organization, Elevated Thought, to produce this short documentary. Projects like this are a terrific example of the role youth voice and agency can play in the community, utilizing arts, sciences, and humanities to address issues in innovative ways. Students are paid to work as producers over the summer through the Mayor’s Summer Youth Employment Program in Cambridge, MA, and learn the skills necessary to produce high quality media reflecting the issues and stories most important to them. They participate in workshops throughout the summer to develop skills around cinematography, visual storytelling, audio, editing, and more. Their final projects premiered at a public screening to a theater filled with family, friends, and community members, covering a wide range of issues including substance abuse, race, different family dynamics, and mental health. A love story, complicated by substance misuse, unfolds in this music video which tells the story of a relationship broken apart. Jermai, Kevin and Bedilu create a surreal world of flashbacks and dreamscapes to represent a young couple’s struggle to overcome the challenges brought on by addiction. Set to the song Bottle Caps by Jay Squared. Tropes within the representation and image of black women in society are broken down by four women telling stories of how they experience stereotypes. Through the combination of personal interviews and examples from popular culture, Allison, Johnnie and Mattingly explore the effect of stereotypes of self-image, as well as how one can react or resist judgement, discrimination and misrepresentation. Shot as a combination of cinéma verité and home video, this portrait of different families takes a look at the differences between how families interact through the universal experience of eating dinner. Matt, Jaqui, and Vera create different scenes to tell the stories of family dynamics as they play out in their friends’ homes as well as their own. Two teens talk about their experiences with mental health, and how they are impacted by the stigma surrounding anxiety and depression. Using animations to illustrate the emotions and experiences being described, Michelle, Jayde, and Rachel try to bring a better understanding to an issue that many teens experience, but not all teens understand. Cambridge Community Television’s School Year Production Program (SYPP) provides teens with an opportunity to develop career readiness and media production skills every year from October to May. The program is a collaboration between the Mayor’s Fall Youth Employment Program, Cambridge Community Services’ CityLinks Program, and Cambridge Housing Authority’s Workforce Program. This year marked the 20th anniversary of Community Art Center’s Do It Your Damn Self – the longest running solely youth-led film festival in the country. Mindful from RAW Art Works’ Real To Reel Program in Lynn, MA. The festival featured a diverse array of films with wide reaching subject matter. All the same, staying true to the original mission of the six founding teen members to, ‘make change in their communities’, themes of social justice served as a through line in multiple films. The film #BlackLivesMatter knit together images of the harsh realities of police brutality cases in recent years and the social unrest that has given rise to protests. Similarly, hip hop music video Pain highlights a young African-American male’s perspective on police brutality. Reach, an experimental film, takes viewers inside the reality of just existing as a black person in modern day America while Fault Lines speaks to how students can easily slip through the cracks of the education system. Reach from YouthFX in Albany, NY. Issues of representation in the media were featured as well. The film Tokenized follows Maggie whose life is changed when she is cast as a token character in her white male best friend Spencer’s story. As Maggie adjusts to life in her new role in Spencer’s story, she becomes more aware of how the unjust “storyboard system” has negatively impacted not only her life but that of her fellow token allies. The film brilliantly ties in LGBTQ issues when a character cast as Spencer’s love interest shows interest in Maggie instead. Eventually, along with her new love interest and other ‘tokens’, Maggie confronts the system eventually flipping the script and gaining her due agency in the process. Other films addressing media representation included The Seated Siren and Life Rolls On. The films (narrative and documentary respectively) touch on what it’s like living with physical disabilities. In The Seated Siren, the heroine struggles with the dating pool being seen as an invalid rather than as a person with feelings. Life Rolls On highlights Danny whose life was forever changed after enduring a sports accident. 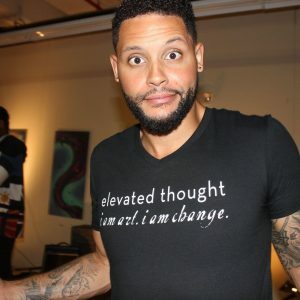 The film emphasizes how Danny is actually not a victim and instead, consistently continues to conquer life and its obstacles each and every day. The festival also had its share of incredibly innovative storytelling. The film By The Way features a love story with a young couple who forms a bond over scribbling doodles on their shared desk. Finally, Mindful has a unique take on the issue of mental illness with a student personifying anxiety, depression, negativity and happiness and placing these characters into a police detective action narrative with a comedic twist. All of the films in their own way offered an inside look at the humanity of a variety of hot topic issues that can often be difficult to fully understand when thought of at all. They were also a reminder of the arts’ power to connect people and create a space for discussion and ultimately understanding. Congratulations to all 2017 winners. What do you do at Elevated Thought? I lead Elevated Thought’s vision, objectives, goals, and mission and facilitate many of our programs and workshops. Additionally, I’ve developed various art and social justice based curricula including our youth empowerment programs Creative. Community. Change. (C3) and Wall Speak. Every year that passes affirms my passion for and desire to see art infused, social action education introduced in the city of Lawrence and cities like it. Studying the history of colonization, slavery, and immigration, I know generations upon generations of the poor and marginalized have suffered from a lack of education and opportunities to expand their creativity and imagination. This passion has given me the confidence to do my small part in providing tangible hope within the current educational climate and within the communities we serve. What comes easiest to you in this work? Waking up everyday and never questioning what I do and its purpose. What challenges you in this work? For many high school youth who have never been asked to embrace and utilize their imagination, the process of creative discovery can be novel and, at times, utterly confounding. The majority of them have been creatively stunted in their schools and environment. Disillusioned by content that is far removed from their reality, their personal meaning is often defined largely by despair, escapism, self-aggrandizement, or base means of survival that develop in poverty-stricken areas. Opportunities afforded for the select few further marginalize the majority and deepen the dehumanization process. The dehumanization process begins early on and, for many of the youth we serve, takes place when their creative interests and imagination is demeaned and begins to deteriorate. Breaking down the barriers to creativity and reemphasizing their standing as creatively capable beings can be a long and arduous process. What does it mean to your community that you do this work? We believe, as do other organizations and individuals spearheading this recent insurgency of arts in the city of Lawrence, creativity and imagination are keys to progress and empowering the individual and larger community. How do you blow off steam? Basketball, watching films with my wife, reveling in family and fellowships. What do you create in your free time? Poetry, experimental films, and ways to make my 7-month-old laugh. Whose work in the CYD field do you admire and why? My mentor and good friend Dr. Lou Bernieri, Director of Andover Bread Loaf (ABL). ABL uses literacy to enable participants to release the power of their voice and their capacity for school and civic leadership. Elevated Thought has been greatly influenced by ABL, now working in Lawrence for almost 30 years. What music do you like listen to (if even a little too loudly)? Movie soundtracks, chillwave, ambient, and synth beats. The Magic of JuJu by Kalamu ya Salaam. Luis started at the Community Art Center when he was five. He is hard of hearing and had difficulty reading and writing at school. He was a naturally exuberant child who was often at odds with his very traditional Haitian grandmother. When Luis came to the Art Center, he discovered a love of theater and dance and a group of adults and kids who celebrate who he is. 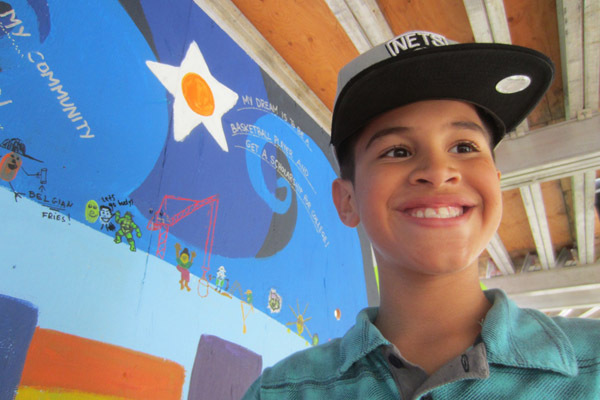 In the spring of 2012, Luis was voted onto our Youth Advisory Board and worked with his peers to complete a 100 foot mural along Massachusetts Avenue. Because of his flair for expressive speaking he was selected to address the audience about the mural making experience. One of his classroom teachers happened to walk by when Luis was reading the speech he wrote himself. She emailed the school principal the next day saying she had no idea what Luis was capable of. When I was forwarded a copy of that email I was proud of Luis, but that idea, that she “didn’t know what Luis was capable of” felt like a small tragedy. At the Community Art Center, Luis found a way to take in information and a way to express himself. He learned how he learns. Luis is now 14 and in his second year in our Teen Media Program. He still struggles in school, struggles to live up to his grandmother’s expectations, but in our program, he continues to succeed and has just started to direct his first film. Tanisha’s mother died suddenly when she was just seven years old. She started at the Community Art Center a few months later. During program, Tanisha kept to herself. When she was nine, she was given a journal in class at the Art Center and instead of leaving hers behind in the classroom like the other girls, she carried it around with her and wrote often. Although her father and our staff were convinced she was grieving deeply, she never spoke about her mother – out loud or in her journal, which she eventually started sharing with one of our teachers. The year Tanisha turned 12, she wrote her first poem about her mother in one of our programs, which she turned into a song. When Tanisha took the stage to sing her song at our end of year celebration, she got through the first line and began to cry. Her father walked her off the stage but the audience kept cheering and eventually she walked back out and bowed. We don’t see Tanisha around the Art Center very often these days. She’s 15 now and her first years as a teen were full of difficulty. She comes by to visit every few weeks but isn’t officially signed up for a program. I see her all the time, though, around the neighborhood, walking alone or sitting on a bench, always carrying or writing in her journal. When Raymond started our teen program, he was one of those kids who sat in the corner and watched the world go by. He was so quiet and seemingly disengaged, that we sometimes wondered why he kept coming. He seemed to like film making, but only really focused on the process when he was assigned the meticulous task of editing. During his second year with us, he was invited by staff to join our leadership group, DIYDS!! Crew – the group that curates and plans our Do It Your Damn Self!! National Youth Film Festival (DIYDS!!). It was in the quiet of the curation room that Raymond started talking. He had opinions about film. It turned out he spent much of his time outside of the Art Center watching movies. Raymond served on our Crew for the next two years and his senior year was asked to emcee the premiere screening of the film festival. Raymond got into college nearby but stayed in touch, coming back to help lead the DIYDS!! curation process. Raymond is 23 now, lives at home with his mom, and works hard to support his daughter, who just turned 2. I just got a call from him to be a reference for an entry level job at a small local museum. I gushed about him, of course, and am keeping my fingers crossed. “I guess I keep coming back to the Art Center because it’s like coming home again. You know, like how a kid lets go of his mother’s hand but always comes back to hold it again when they need to.” When Ashley, who just aged up into our teen program made this statement recently, I thought now THAT is the real definition of creative youth development. They keep coming back to it, and we keep coming back to it because somewhere in the process, we will find that mural event, that journal, that film critique that will make enough of a difference – help young people get their needs met and through that process find meaning for themselves, and give meaning to all of us. Eryn Johnson is the Executive Director of Community Art Center whose mission is to cultivate an engaged community of youth whose powerful artistic voices transform their lives, their neighborhoods and their worlds. For over 80 years and for all but 10 weekdays of the year, the Art Center provides a second home to over 100 youth in Cambridge, MA. “They made their costumes by hand. Everything you see is 100 percent them,” said Chris Gaines, director of the Real to Reel Film School in Lynn, MA. A full write-up about this project also appeared in Yahoo Movies. Entries must be accurate, thorough, creative, engaging, and fun. Entries will be judged first by a panel of Cubist scientists and then by a panel of 5th graders. The individual winner will receive a GoPro video camera. The team/class winner will receive a $1500 gift certificate to buy hands-on science supplies. Deadline to enter is March 28. Simply post the entry on YouTube or Vimeo and send the link to: CambridgeSciFest@gmail.com. Please include your full name and age in the email. Both winning videos will be shown at the 2014 Cambridge Science Festival. Learn more. 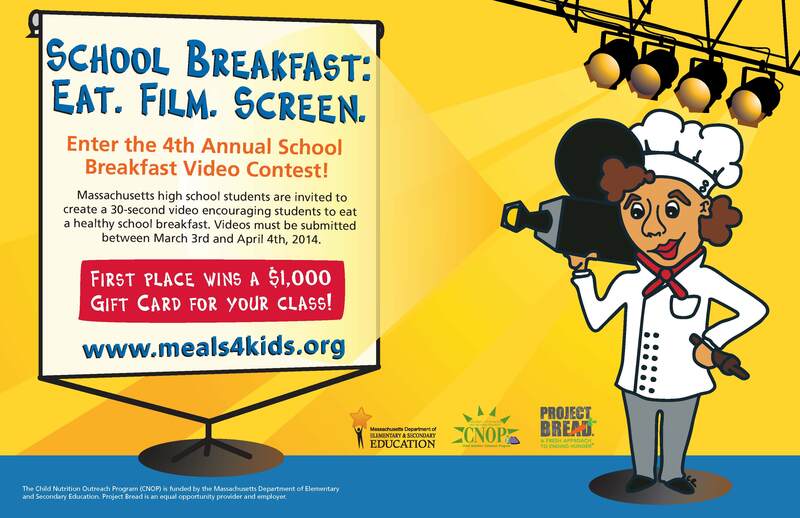 Massachusetts high school students are invited to submit a 30-second video promoting the school breakfast program and encouraging their peers to eat a healthy school breakfast. 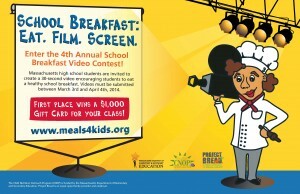 Gift card prizes (to be spent on a classroom or out-of-school program) up to $1,000 will be awarded. Submissions will be accepted March 3 – April 4, 2014. Contest rules and tips available now. Sponsored by the MA Department of Elementary and Secondary Education and Project Bread, and managed by the Child Nutrition Outreach Program. This video, I Am A Muslim, was produced by teens in Cambridge Community Television’s Summer Media Institute in July of 2013. It explores Muslim stereotypes and what it is like to be a Muslim in Cambridge, MA. Produced by: Iman Gheraissa, Avery Guan, and Liam O’Connell.